Placenta previa - what now? 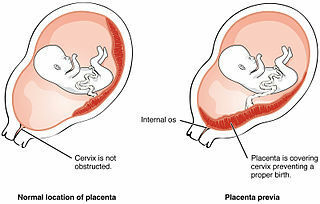 Placenta previa is a placental abnormality that means your placenta is covering the cervix, or is located right next to it. It is a serious medical problem, that can sometimes lead to bleeding during pregnancy and means that the baby cannot pass through the birth canal. Placenta previa can be marginal (when the placenta is very close to the cervix) or complete (when the placenta totally covers the cervix). In the case of a complete placenta previa, cesarean section is the only way to give birth. What do you need to know if you have been diagnosed with this condition? It is not uncommon to be diagnosed with a low-lying placenta in the second trimester of pregnancy. While such a diagnosis can indeed indicate that your placenta will be low-lying at term, that does not have to be the case at all. If your healthcare provider has told you that your placenta is alarmingly close to your cervix in the first half of your pregnancy, after an ultrasound, don't panic just yet. As the uterus grows, the location of the placenta generally moves up in relation to the cervix. Only one out of ten women who had low-lying placenta in the second trimester still have it when they are due. If you are diagnosed with a complete previa, you will be monitored closely. Your doctor may recommend bedrest, especially if you have had vaginal bleeding. Most of the time, pregnancy progresses safely when placenta previa is present, but there is a higher chance of complications so additional monitoring is in order. As the cervix begins to dilate, even a little bit, the placenta's blood vessels can be affected. Of course, you should contact your doctor as soon as you notice any bleeding. Third trimester bleeding is common in many with placenta previa, and it could signal a need for immediate delivery even if the bleeding stops soon after it started. Women whose placenta covers the entire cervix have to deliver by c-section. This is the only safe way to give birth. Even women with only a partial previa often have cesareans, because the baby could brush on the placenta a lot during birth, thereby causing excessive bleeding. A low-lying placenta in the second trimester - what now? Third trimester bleeding - what could it be? Second trimester bleeding - what could it be?